Kevin Horkin MBE with HRH Prince Charles. Philanthropist and charitable fundraiser Kevin Horkin received an MBE at an investiture ceremony conducted by HRH Prince Charles at Buckingham Palace. Kevin Horkin with Vicky Entwistle and his mum Wendy Smith after receiving his MBE. These include the Car Bun Nesta orphanage in Romania, the Community Foundation for Merseyside and Lancashire, The Kirsty Appeal named after Kirsty Howard who died quite recently and has helped to raise funds for Francis House Children’s Hospice in Manchester. 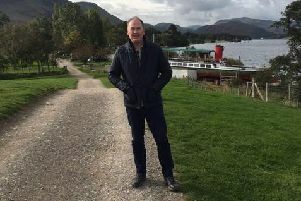 Other causes that Kevin has supported include the Clitheroe Community Fund, The Pet Role Trust which raised funds for the Manchester Dogs Home amongst others and Lord’s House Farm, which provides support for disabled and disadvantaged adults. Kevin was accompanied at the ceremony by his mum Wendy Smith and long time friend, Vicky Entwistle, who played Janice Battersby in Coronation Street and who he has known for 25 years. Kevin added: “I’m utterly delighted to have received this award today from Prince Charles who I met on his recent trip to Clitheroe. Details of the investiture ceremony during which Kevin Horkin was presented with his MBE. “I consider it a great accolade to be receiving this honour on behalf of the large number of hard working individuals who staff the charities I represent which do such very good works on behalf of such a large number of deserving individuals. It is really them that deserve this award. During the investiture ceremony HRH Prince Charles asked Kevin whether they had met on his recent visit to Clitheroe and quizzed him about the time he used to supply animals to Coronation Street and other TV programmes through Kevin’s former business Pet Role - Celebrity Pet Agency which the Prince said must have been really interesting. Charity stalwart Kevin was elected in 2014 to serve as the town mayor of Clitheroe and in his quest to raise more than £100,000 for good causes in the area he opened up a charity shop. His mayor’s ball also raised more than £7,000 in one evening. Kevin Horkin with his MBE. Kevin, who is the founder of the Spex chain of opticians, also has Clitheroe shops Ken Varey’s Outdoor World, Lady Clitheroe and the Footwear Gallery. He has also been a town and borough councillor. In 2011, Kevin was awarded the “Philanthropist of the Year” Award in the “Spirit of Lancashire” Awards organised by the Community Foundation for Lancashire.